We tend to receive the most questions about ice pops, during the summer months. How do you make them? How do you layer them? Where did you get the popsicles molds? How do you store your ice pops? How do you pick the flavors? These are all frequently asked questions. Over the next 3 weeks we are going to answer these questions and more. How do you choose the flavors? Making ice pops has become a fun family activity from picking out the fruit to pouring the ice pops and choosing what molds to use. Chad, Munchkin and I all get involved. I usually start with the weekly ads. I find the perfect fruit that is on sale and in season. I am a very smart shopper. I am always on the look out for the best price for the best ingredients. 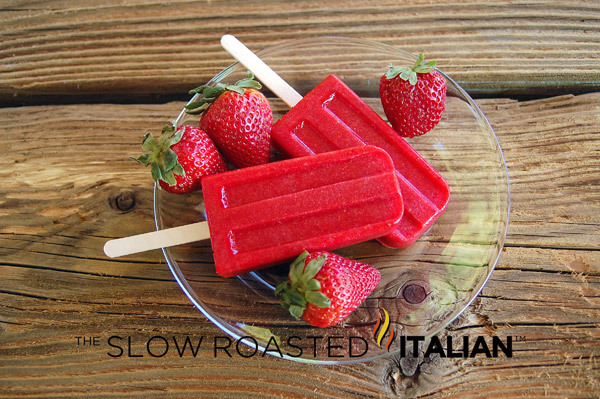 The first pop we posted was the Sublime Strawberry Popsicle. That week of pop making we discovered a fantastic price on the most flavorful strawberries, so we headed to the grocery store and purchased them while they were at the height of season. All of us participated in picking out the fruit. I took it home and prepped. I created an amazing recipe to highlight the strawberry flavor as much as possible. We then picked the mold that would best highlight the features of the pop and pour them in, add popsicle sticks and freeze. Where do you get your molds? We have purchased all of our molds from Amazon, eBay and I also use ‘bathroom cups’ from Walmart. The Progressive mold is our favorite. It holds about 3 ounces. It is really traditional looking and all the ice pops release beautifully. The Sublime Strawberry Popsicle was made in this mold. The Fruit of the Islands Ice Pop was made in another mold we love; the Donvier by Cuisipro that we purchased on eBay. Truth be told, I saw that mold on an episode of Throwdown with Bobby Flay. I loved the look of them so I had to find them. We also have a few others that we bought and returned and some that you have not seen yet. Most box stores have a few to choose from this time of year. I have noticed that the 99 cent Store even carry a mold that looks like the Kidco that I am going to discuss next. I found that the one from the 99 cent Store was NOT BPA free. So, I decided on the Kidco (which is BPA free). 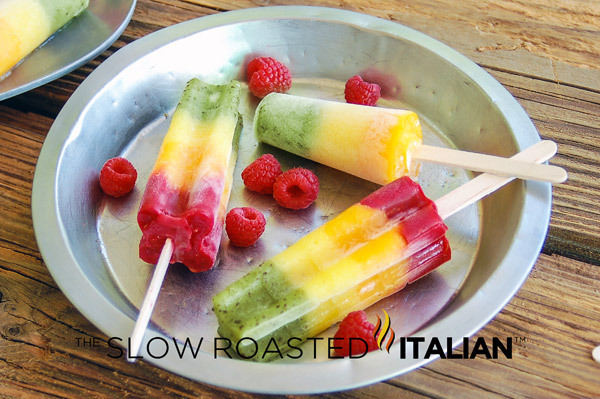 These Fruit of the Island Pops: Kiwi, Pineapple, Mango, and Raspberry Ice Pops are loaded with vitamin C & E, minerals and antioxidants! Perfect summer treat! We have 2 favorite ‘Munchkin pops’. The small pops you saw in the Fruit of the Islands Ice Pops are by Kidco and are also purchased on Amazon. The second ones we call ‘cupsicles’. We used these in the Cantaloupe and Cream Lime Ice Pop. Walmart sells 3 ounce plastic cups labeled ‘bathroom cups’ in a 100 pack. They are perfect and Munchkin loves these too! Cantaloupe and Cream Lime Ice Pops are cool and refreshing. 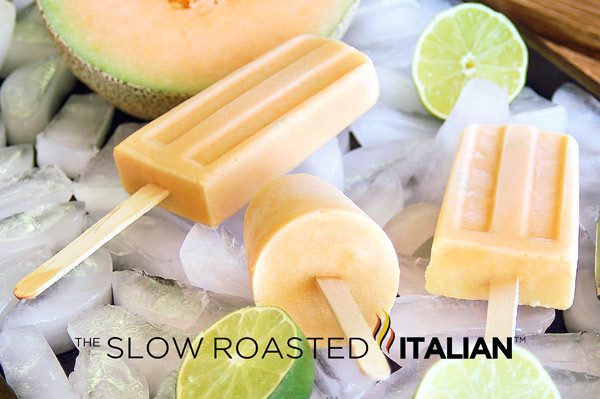 Packed with cantaloupe & lime flavors. A special ingredient makes it creamy. You really can freeze just about anything in those molds. It is more a matter of taste and preference, a lot of trial and error too. Feel free to ask any pop making question you have in the comments. We love to hear your comments and feedback. If you make or bake any of our recipes please tell us about it in the comments or in an email. Have a fabulous weekend, and get your Ice Pop on! I really liked this post! Pretty inspiring! When I was younger, my family used to make popsicles too, but then my brothers and I grew up and lots of little things become lost, such as the popsicle art. I've been delighted with your popsicles lately, but I haven't had the guts to try one of your recipes yet! I must find some molds at the mall to get started again! I can't believe I'm letting the summer go by and haven't made any popsicles yet. Great tips on where to find molds, thanks! Yippee! I'm so glad you're doing this Donna - thanks for all the great tips! LOVE your pops!